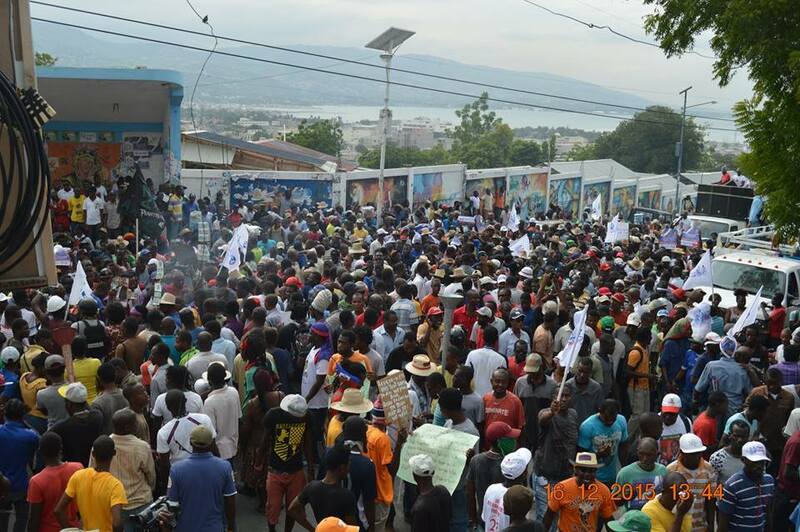 Fanmi Lavas supporters protest in the streets of the Port-Au-Prince in support to their candidate Dr. Maryse Narcisse. Photo from Fanmi Lavalas presidential Dr. Maryse Narcisse Facebook page. For too long, people paid by Haitian people to do their job have not been held accountable. Now, it’s the time for the Haiti’s electoral officials – the Conseil Electoral Provisoire (CEP) – to either fix the electoral mess or go to jail. It is despicable that a CEP official threatened to shut down the whole electoral process instead of collaborating with a government-backed commission to investigate massive electoral frauds that they fail to avoid. Marie Carmelle Paul Austin, a member of the electoral council, told a radio in Haiti’s capital that the electoral council members are ready to depart in bloc “If this commission’s purpose is to redo or verify the work that the CEP has already done, the council members will resign.” What Madame Austin did not say is that when you betray your people, violate your country’s laws and contribute to social and political destabilization you should be in jail. For too long, Haitian people have been struggling for participative democracy and social justice. They’ve been ignored by Haitian officials who primarily seek to satisfy the interest of their international backers like the United States, Canada and France by either plotting electoral coups. Although the Martelly administration finally established a commission to address the latest electoral disaster, it is uncertain that anything will come of it. Martelly himself was a beneficiary of an electoral fiasco. How can one believe he will accept any recommendation asking the removal of his handpicked candidate? This move reminds me of an article by Haiti’s renowned author Edwidge Danticat: Sweet Micky and the Sad Déjà Vu of Haiti’s Presidential Elections. For too long, the business elites have been exploiting Haiti’s masses for the sake of becoming wealthier than they had ever before. They have involved in concocting the invasion of Haiti by the U.S. in 1915, as well as the occupation of Haiti by powerful international players under the banner of United Nations (U.N.). Thanks to their loyalty to the U.S. transnational corporate class, they have been able to succeed in imposing their free-market-based economic plan, and their neoliberal-style democracy on Haitian people through different electoral masquerades. Together with U.S. States Dept., in 2010, they orchestrated an electoral coup by threatening to depose Haiti’s then President Rene Preval should he refuse to swallow U.S.-backed Organization of American States’ electoral de facto results. For too long, the United States has been undermined democracy in Haiti by either supporting dictatorship or electoral coups. Now, it’s the time for American taxpayers to hold U.S. officials accountable for using their dollars to fund coups and flawed elections. In a first ever democratically organized election on Dec. 16, 1990, Haitian people elected a former priest and liberation theologian, Jean-Bertrand Aristide as the country’s first democratically elected president just to see him overthrowing in bloody military coup supported by the U.S. and financed by the Haitian business elite seven months after he took office on Sept. 30, 1991. Some the coup leaders were trained at U.S. military school and were under Central Intelligence Agency ‘s (C.I.A) payroll. In Nov. 2000, in another presidential elections marked by high turnout, Aristide won a second term and his Fanmi Lavalas party won the majority of the seat in both Haiti’s higher and lower chambers. On Feb. 29, 2004, he was forced to leave the country aboard a U.S. military plane to Central African Republic then South Africa where he and his family spent 7 years in exile. His party was also banned from participating at the electoral process during those years. As Brian Concannon wrote, the U.S. has been religiously supported Martelly since he ascended to power using its diplomatic and financial leverage to legalize the president’s unconstitutional decisions. The U.S. spent over $30 million for the organization of long overdue elections, now it’s the time for Obama administration to use its diplomatic and financial leverage to make his man in Port-Au-Prince do the right thing. The clock is ticking; Haitian people have been patient, resilient and vigilant throughout the democratic process, and they have showed no sign that they will validate a 2010-style electoral coup. Now, it’s time for the CEP officials to do their job or go to jail. Wadner Pierre is a Haitian award-winning Photojournalist based in Shanghai, China. He is the founder of UnWelessWeCare.org and co-founder of Haiti Analysis blog. He completed a Master’s degree in International Relations at the University of Aberdeen, Scotland, UK, with a focus on International Security and Human Development.